When I try to use APWIN, AP2700, or ATS software I get an error message telling me the hardware is not properly installed or not powered on. I’ve checked everything and it all seems to be turned on and connected correctly. What should I do? Your APIB driver is probably not installed properly. Click the Start Menu, and choose Settings | Control Panel | System. Click the Hardware tab, and then click the Device Manager button. Find APIB in the list of devices and expand it. If the driver is not properly installed, it will display the yellow warning icon. Right-click on the device with the yellow warning icon and select Update Driver. 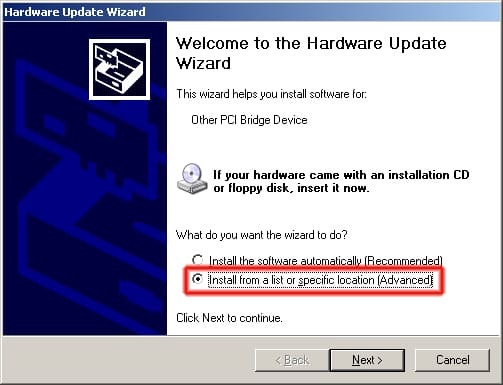 In the Hardware Update Wizard, select “Install from a list or specific location (Advanced)” and click the Next button. 3. Select “Don’t search. I will choose the driver to install.” and then click the Next button. 4. 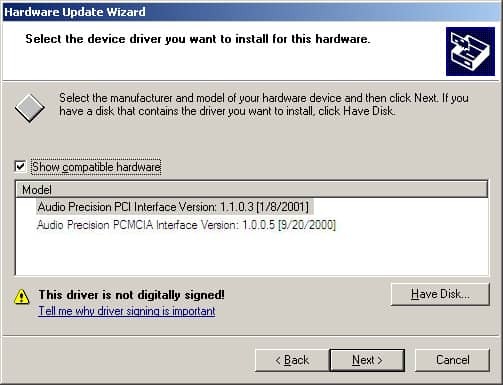 If the driver you need (PCI or PCMCIA) is displayed in the list, select it and click the Next button and then the Finish button—your driver setup is now complete. 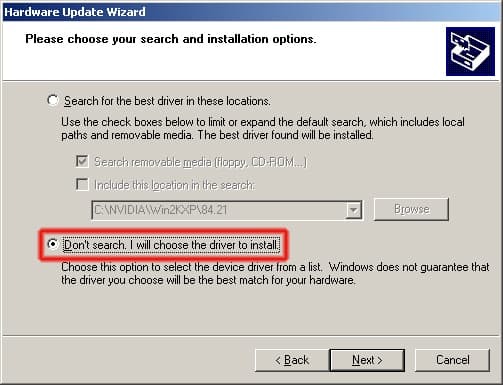 If the driver is not listed, click the Have Disk… button and continue to the next step. 5. Click the Browse… button and navigate to C:Program FilesAudio PrecisionAP2700 3.30Driver, where AP2700 3.30 is the name and version of your installed Audio Precision control software. 6. 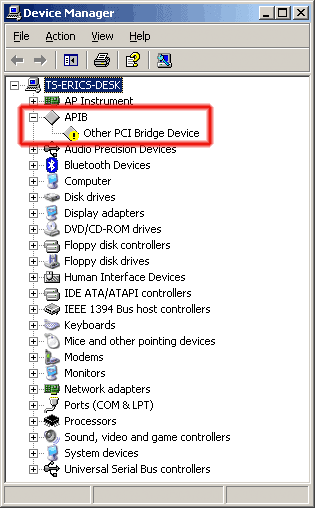 Select the driver for your AP interface card (apibpci.inf for PCI cards, apibpcm.inf for PCMCIA cards, or apibusb.inf for the USB interface) and click Open. Click the OK button, the Next button, and then Finsh. Note: If the driver directory and/or driver files are missing (not installed on your hard drive), you may download the APIB Windows driver installer below..